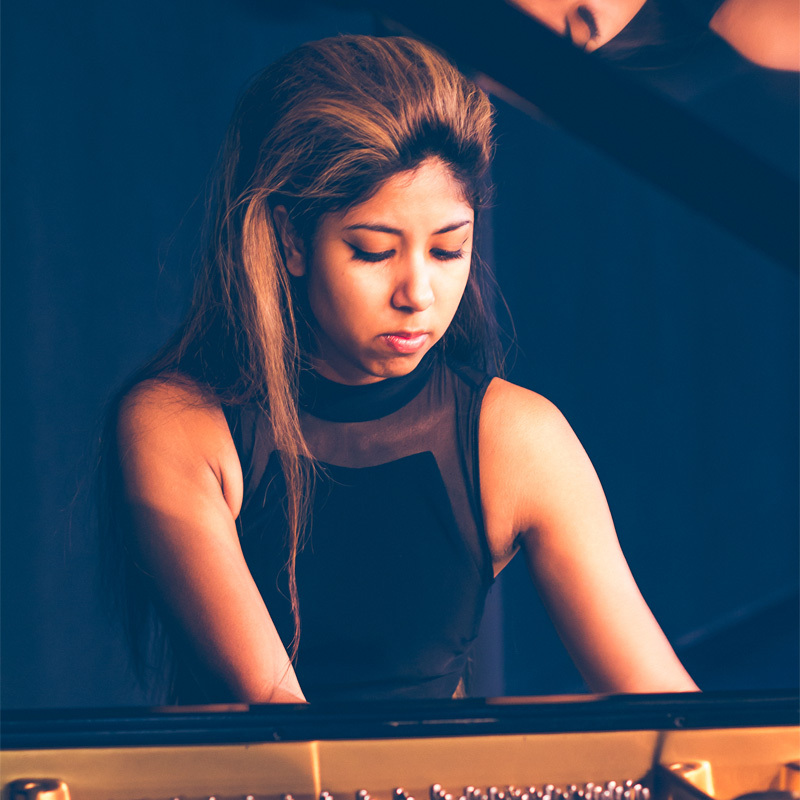 Summer Swee-Singh is a classically trained, award-winning pianist / keyboardist, music arranger, composer, backing vocalist, string contractor, ensemble leader, music director, and music educator. Masterful in a variety of genres, the UC Berkeley alumna performs classical, rock, pop, hip-hop, electronic, indie, rap, reggae, and more as a solo pianist and backing / ensemble touring and session musician; her studio/touring credits as a pianist/keyboardist, arranger (strings/keys/orchestral), composer, string contractor, and/or backing vocalist include the likes of Circa Survive, Anthony Green, Chon, KSHMR, Chief Keef, Until the Ribbon Breaks, and more. She has had many of her instrumental arrangements and compositions reposted and/or praised by the likes of Skrillex, Anthony Green, Ed Banger Records, Polyphia, Mike Sapone, Campa (of the Cataracs), Steinway & Sons, Dustin Kensrue, Arnold Schwarzenegger, MainlyPiano, Audiomack, and more, resulting in Summer amassing an impressive number of YouTube video views and followers on her various social media profiles. Summer also founded and leads an all-female ethnically-diverse piano and string ensemble (as its sole pianist and string arranger/composer), called “Summer Swee-Singh & the Heartstrings”, comprised of a rotating roster of top-notch string players based in both LA and NYC and herself; she and her ensemble can be hired for studio work, music videos, and tours / live performance (backing artists). Having performed as a soloist for crowds up to 10,000 people and having been interviewed and featured in LA Weekly (2012), Summer has become known a modern master of both performance and arranging–especially arranging medleys. She is also known as the “Piano DJ” because of her ability to seamlessly transition from piece to piece and genre to genre on the piano, much like a live DJ set. Aside from writing arrangements and performing, Summer discovered her love for composing in 2016. As a composer, Summer has been praised by the likes of Richard Clayderman, Carlos Rafael Rivera, Jonathan Estabrooks (Host of Classical Crossover Radio International), Joachim Horsley, and Kathy Parsons of Mainly Piano, among others. In 2016, Summer released her debut, piano-driven album of original pieces titled “Summer Swee-Singh & the Crazy 88”, and in 2017, she released her first professional music video for her composition “JFN (with Prelude)”. Summer is currently working on her sophomore album which is slated to be released in 2019. Summer’s unique background, innate melodic sense, and passion for her work shine through in every note she plays and every melody she composes.